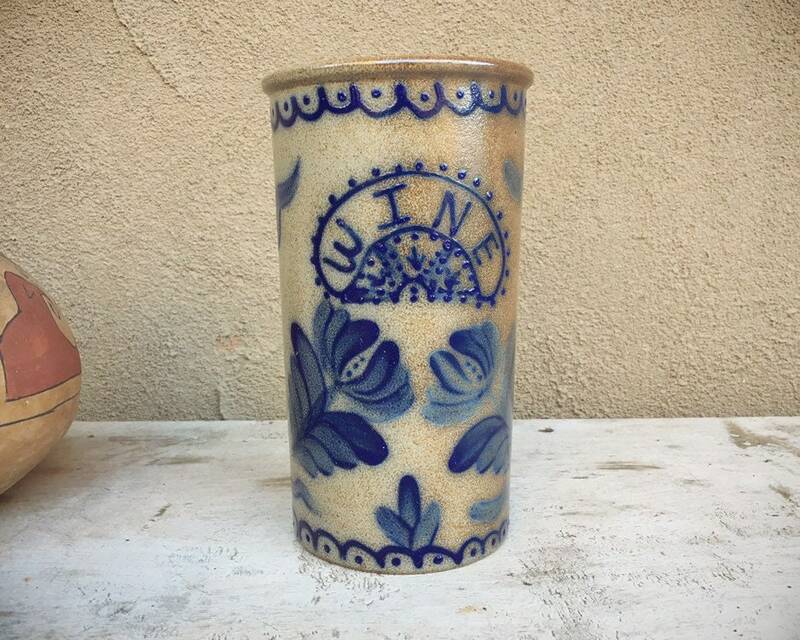 This salt glaze jug is striking and features the word "WINE" and beautiful images of flowers or leaves. Although the signature is hard to read, I can make out the cross sign, which tells me that it is made by potter Jerry Beaumont, who has an interesting personal story. 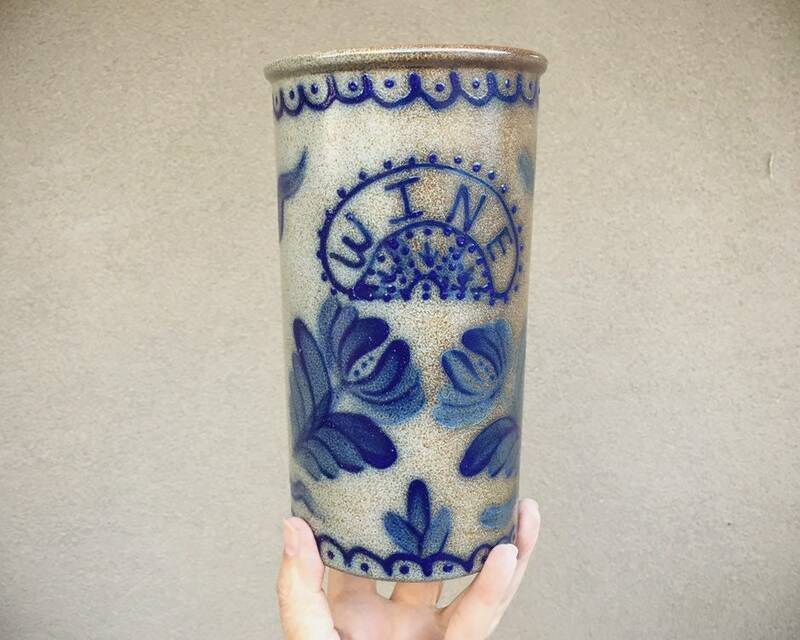 From his website: "I began making pottery at the age of ten when my mother, Alice (always my greatest influence and encourager), took me to a ceramics studio near our home on Long Island. She let me set up my first wheel in the kitchen (without a splash pan), and my dad helped me build a gas kiln in the backyard... I married my high school sweetheart. The business was incorporated as Beaumont Heritage Pottery, and we specialized in authentic reproduction salt-glazed stoneware. In 1973, my wife and I accepted Jesus Christ as our personal Lord and Savior. Since that time—even in the darkest times—each pot I have made is signed with the Cross, my initials, and the year... The pottery continued to grow, and we moved into York, Maine, where the business thrived. During that time, we had two beautiful daughters... We were active in a local nondenominational church, working with youth ministry and attending Bible college classes. I had it all. Then, in 1989, a series of bad decisions caused me to turn down a road that took me away from God. I lost my company, my home, and my walk with God. I became the “prodigal dad”–desperate, having no fellowship and, what seemed like, no place to turn. I know, now, that God still held me in His hand. In 1998, virtually homeless and in debt, my daughters encouraged me to turn to God and let Him run my life again. I hitchhiked out of the mountains of North Carolina with one set of clothes and enough money for a train ticket to Baltimore...Today, in each piece of pottery, you see the fruit of God’s work. Indeed, He is the Potter, and we are the clay." 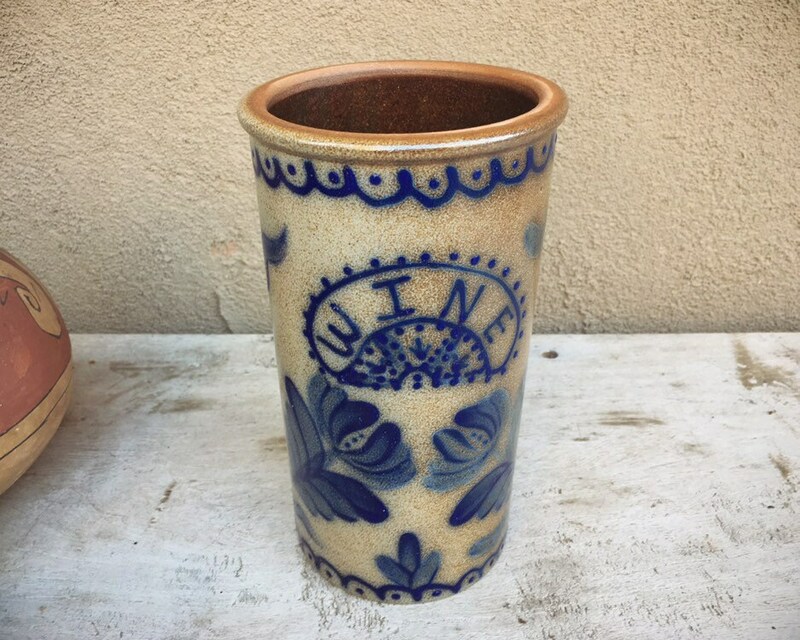 The vase is beautiful yet practical, made to hold a bottle of wine, the stoneware keeping it cool. But it could be used to hold wooden utensils in the kitchen, a bouquet of vintage pink roses on a farmhouse table for a celebration outdoors, or as a shelf accent in any room. The blue contrasts beautifully with natural woods, and can fit so many decor styles, from Rustic to Eclectic to Modern. Measures about 8" tall and the base is 3-3/4" in diameter. The opening is 3-5/8" in diameter. Weighs over three pounds unpacked. 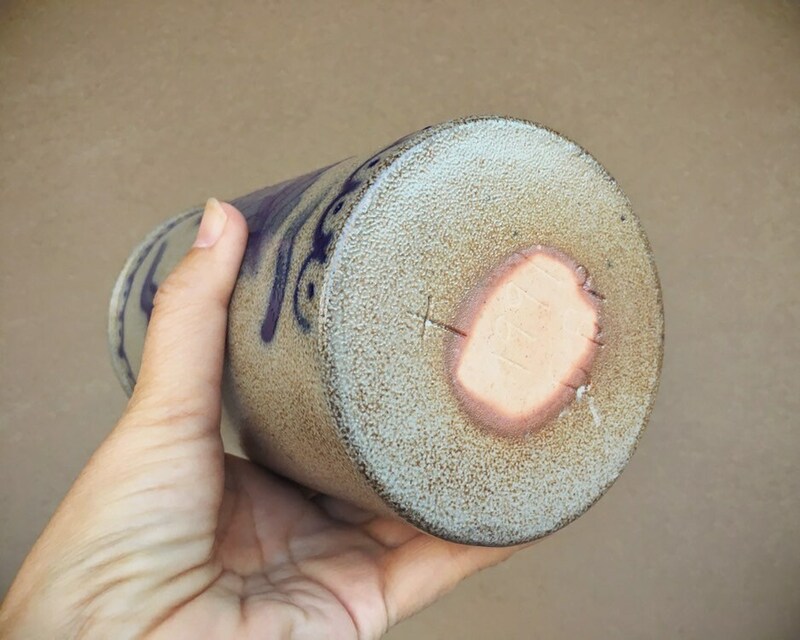 The edge along the mouth has some roughness, and there are dark splotches in the glaze that are part of the glaze process. Otherwise in good vintage condition. 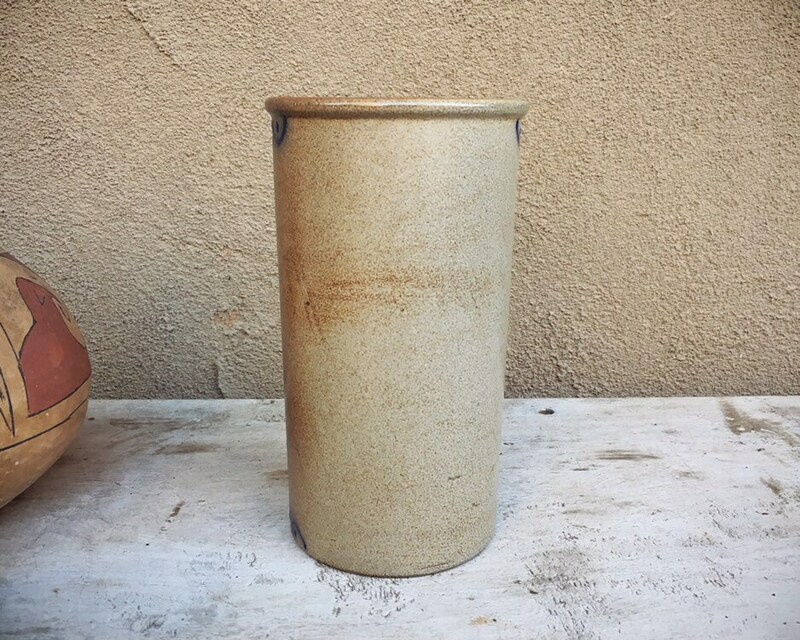 A simple and gorgeous piece of traditional pottery.